LynchyRightNow: You Can't Tell Me . .
Florida, Alabama, and Texas are all undefeated and have flexed their muscles more than once this season. With 'Bama & the Gators on a crash course for the SEC Championship, it seems as though the Longhorns are in, barring any disasters in Austin. However, if the season were to end today, those three top programs would be joined by four others with cases to make. Believe it or not, You Can't Tell Me each one doesn't deserve the same opportunity to play for that same crystal football. You Can't Tell Me, the Iowa Hawkeyes don't deserve a shot. Wins in Happy Valley, Madison, and Lansing give them credibility. A "W" in Columbus seals the deal. Iowa is in the midst to their best start in school history, they've won in blowouts, comebacks, and close calls. I'm going to leave this one on the shoulders of junior signal caller Ricky Stanzi. Able to overcome untimely interceptions against the Hoosiers is one thing, however, against Ohio State that won't be likely. The Buckeyes are currently 3rd in the country in interceptions, and 11th in sacks, they'll put pressure on Stanzi and force him to make decisions, good or bad. It's possible the Hawkeyes will be playing for more than Big 10 supremacy, how Stanzi and the Hawkeyes finish in Columbus will determine that. You Can't Tell Me, the Cincinnati Bearcats don't deserve a shot. Losing a Heisman candidate in mid-season would crush any team, not these pesky Bearcats. As Cincy's senior quarterback Tony Pike went into surgery, the Bearcats wrapped up South Florida and waxed Louisville & Syracuse under sophomore Zach Collaros who hasn't missed a beat. They are the true beasts of the Big East, two of their final four games are against the best the conference can offer, West Virgnia and a regular season finale in Pittsburgh. Say what you'd like about their non-conference schedule, but wins in Corvallis don't come easy. In the early-going, the Bearcats won by putting a 21-point second quarter on the board against a tough Oregon State squad, at night! Boasting a schedule that includes wins in Piscataway, South Florida and possibly Pittsburgh would give the Bearcats as good a shot as any. Place this one on neither Pike or Collaros, but a defense that has yet to give up more than 20 in any game, something neither Texas or Alabama can say. You Can't Tell Me, the Boise State Broncos don't deserve a shot. You know about the Broncos now, you know about the signature blue turf, you know they've been to a BCS game and won before, you know they are the best of the unlikely. When do you start calling them likely? On Saturday afternoon they destroyed a bad San Jose State team to cruise to their 8th win with five remaining. However, it was the Oregon Ducks taking care of business in Eugene that same day which should validate the Broncos season. The BCS puts Oregon at #8 after their blowout win against Southern California. Boise State shredded that Ducks team in the first week of the season, the more they win, the better Boise looks. Now, I'm a realist I'll tell you they don't have a tough schedule, but they may have the strongest win of any of the previously mentioned teams that remain unbeaten. Boise is experienced, tested, and plays at their best in big spots. Bottom line is, if the BCS claims Oregon is the best of the one-loss teams, and that one loss is to the Boise State Broncos, they make a tough argument. You Can't Tell Me, the Texas Christian Horned Frogs don't deserve a shot. Currently, the Horned Frogs are #6 in the BCS rankings as of Sunday night, and showing no signs of letting up. The Mountain West leaders are putting together an extremely healthy resume. Already, the Horned Frogs are 4-0 on the road, most impressively their 38-7 shellacking of the at the time 16th ranked Cougars of Brigham Young in Provo. That's not all though, TCU has won at Virginia, Air Force, and in Death Valley against a Clemson team that is on track to play for a shot at the Orange Bowl. With another dominating performance against Utah in two weeks, TCU would cement their destiny and win another game against a bowl bound team. Most likely the least talked about quarterback in the state of Texas, Andy Dalton is leading the Horned Frogs to a great season putting up some big numbers. Dalton has tossed over 1,600 yards and 14 touchdowns while only being intercepted three times. If Dalton plays against Utah like he has against both Clemson and BYU after that, TCU will be in great shape to shock the BCS. If Utah can play in a BCS bowl game from time to time, then TCU shouldn't be called an underdog. Love them Horned Frogs. Seven teams with zero losses through eight weeks. I could go and tell you how all this could be avoided with an "eight-team playoff," however with over a month left things will work themselves out. Can Iowa win in Columbus? 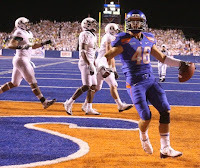 Will Boise State win by enough? Does Texas Christian have what it takes to beat Utah? Do the Bearcats have a strong enough schedule? More importantly, is it possible that Texas and Florida could have a hiccup? MAN, I LOVE THIS GAME!